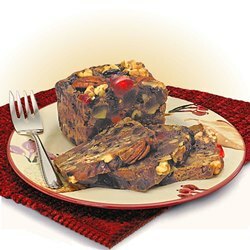 Brandy Fruitcake: Pineapple (corn syrup, high fructose corn syrup, water, artificial flavor. 1/10 of 1% sodium benzoate, sorbic acid, sulfur dioxide), Raisins, Cherries (corn syrup, water, sugar, citric acid, preserved with less than 0.1% sodium benzoate and potassium sorbate, red 40, sulfur dioxide [preservative]), Walnuts, Honey, Wheat Flour (enriched with vitamin C, ascorbic acid, niacin, reduced iron, thiamine mononitrate, riboflavin and folic acid), Eggs, Pecans, Water, Margarine (liquid vegetable oil [soybean, canola], partially hydrogenated soybean oil, water, salt, whey [milk], lecithin [soy],mono diglycerides, sodium benzoate [as a preservative], artificial butter flavor, beta carotene, vitamin A palmitate added), Natural & Artificial Flavor, Spices, Salt, Brandy, Benzoate of Soda (added as a preservative). Contains: wheat, eggs, milk, soy, walnuts, pecans. May contain nutshell fragments. Nuts were packed in a facility that processes products that contain peanuts, walnuts, pecans. Ginger Date Nut Cake: Dates, Wheat Flour (enriched with vitamin C, ascorbic acid, niacin, reduced iron, thiamine mononitrate, riboflavin and folic acid), Raisins, Eggs, Water, Honey, Margarine (liquid vegetable oil [soybean, canola], partially hydrogenated soybean oil, water, salt, whey [milk], lecithin [soy],mono diglycerides, sodium benzoate [as a preservative], artificial butter flavor, beta carotene, vitamin A palmitate added), Natural & Artificial Flavoring, Walnuts, Pecans, Cashews, Ginger (with sugar), Natural & Artificial Flavors, Salt, Spices, Brandy, Benzoate of Soda (added as a preservative). Contains: wheat, eggs, milk, soy, walnuts, pecans, cashews. May contain nutshell fragments. Nuts were packed in a facility that processes products that contain peanuts, walnuts, pecans, cashews. Tropical Dessert Cake: Mango (sugar, citric acid, sulfur dioxide, FD&C yellow #5 & #6), Wheat Flour (enriched with vitamin C, ascorbic acid, niacin, reduced iron, thiamine mononitrate, riboflavin and folic acid), Honey, Pineapple (corn syrup, high fructose corn syrup, water, artificial flavor. 1/10 of 1% sodium benzoate, sorbic acid, sulfur dioxide), Papaya (sugar, citric acid, sulfur dioxide, FD&C yellow #5 & #6), Eggs, Macadamia Nuts (milk, wheat, soybean), Water, Rum, Rum Flavor, Almonds, Margarine (liquid vegetable oil [soybean, canola], partially hydrogenated soybean oil, water, salt, whey [milk], lecithin [soy],mono diglycerides, sodium benzoate [as a preservative], artificial butter flavor, beta carotene, vitamin A palmitate added), Dark Chocolate, Natural & Artificial Flavors, Coconut (dessicated coconut, sugar, water, propylene glycol, salt, sodium met bisulfate), Baking Powder (baking soda, cornstarch, sodium aluminum sulfate, calcium sulfate, mono calcium phosphate), Soda (sodium bicarbonate), Salt, Spices. Contains: wheat, eggs, milk, soy, coconut, almonds, macadamia nuts. May contain nutshell fragments. Nuts were packed in a facility that processes products that contain peanuts, coconut, almonds, macadamia nuts. Apr 5, 2019 | By Ed V.
Jan 21, 2019 | By Ellen C.
Delicious! We finished the first one and immediately ordered a second! Will order again next year! Jan 18, 2019 | By Jack A.
I received it in very good and moist condition. It was chockful of fruits and nuts just exactly how I remember eating it in my childhood days. I will definitely order it again next year. Probably the Best Fruitcake for the Price! Dec 29, 2018 | By Stanley K.
moist, compact with fruit & nuts and above all, moist! 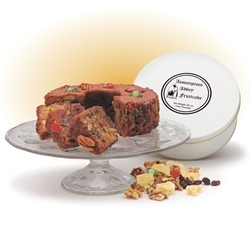 These brandy fruitcakes from the Monastery are the best fruitcakes EVER! All of the people to whom I sent these fruitcakes last Christmas are just waiting, hoping for another one. I'll place my group order early so that we don't miss getting them this year. Many thanks for a delicious treat. Mar 2, 2018 | By NORMAN S.
The absolutely best fruit cake I have ever purchased. My wife & I both feel the same about this fruitcake. Jan 26, 2018 | By maureen l.
This is exactly the way my auntie made fruitcake it can't be any better. Jan 23, 2018 | By Katie F.
This is the best fruitcake we have ever had. We very highly recommend it to anyone. Jan 6, 2018 | By Danielle E.
Nov 26, 2017 | By Danalee L.
This is the only fruitcake I will buy. The balance of flavors and density of fruit is perfect and the liquor is a plus. I buy it for friends and I buy it for myself. You won't be disappointed! I really love this fruitcake and you could actually taste the brandy. It is so rich that I would have only a very small piece each night. 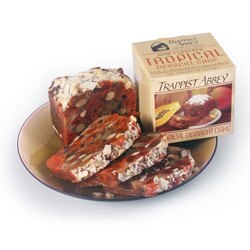 I purchased my second Abbey's fruitcake from Amazon. For some reason the one I bought directly from the Abbey's online store tasted better...not sure why. Anyway, I highly recommend this cake and well worth the price. The best fruitcake I ever tasted! Very rich, moist and fresh. I hope next time you will make them a little bigger! I will highly recommend this product to anyone. Jan 8, 2017 | By Virginia P.
Absolutely delicious. Rich, loaded with nuts and fruits, wonderful flavor. Shipping was fast. Dec 27, 2016 | By Catherine C.
Dec 20, 2016 | By susan w.
It has become our family tradition to order this fruitcake for many years. It is the closest to my great-great grandmother's recipe that we have found. We always wait to slice it on Christmas morning after all the presents are open.Just wouldn't be Christmas without it. Dec 12, 2016 | By LaMon B. Every year for the past several, I have gotten the one pound Brandy fruitcake. It is just enough to get me through the season and it is always, always good! I buy this fruitcake once a year because I'm a heart patient and must watch the fat content, so I treat myself to the best fruitcake that I know! Nov 5, 2016 | By Roxanne K.
The fruitcake was indeed heavenly! The perfect tea time treat! Oct 25, 2016 | By Leo B.
this fruitcake was real good. the only problem is I only ordered a one pound cake, I should have ordered a bigger one. Oct 25, 2016 | By Diane M.
Best fruitcake ever! We were not able to find a really good one for decades. The company we dealt with cheapened the product to something dry and mostly cake. Feb 9, 2016 | By Diane E.
This fruitcake was the best I've had since I was a child when each Christ- mas we were given a special homemade brandy fruitcake. Next time I will buy a 2 or 3 lb. cake. Jan 3, 2016 | By Jody S.
It is probably my own fault but I read the description and assumed dried fruit meant dried fruit, not candied fruit. I should have looked more closely at the picture. Would be great if I liked candied fruit but I don't. However, it is a good moist cake. I've been purchasing fruit cake for my mom from several "brand" name gourmet stores. 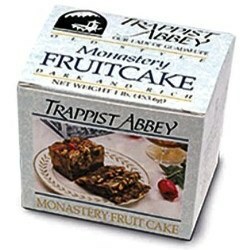 This year I purchased from Monastery Greetings and my mom said this was the best fruit cake she's ever tasted. I'll definitely be purchasing from Monastery Greetings again. This was a gift for my husband. The fruitcake was amazing. Service was excellent. Thanks for making it easy to support our church! 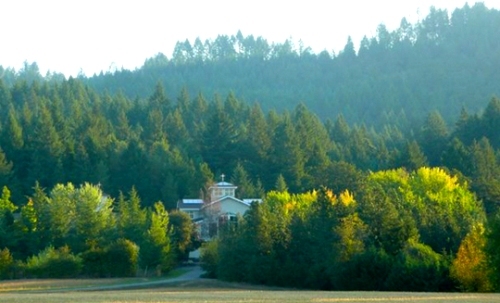 Dec 8, 2015 | By Diane M.
I get this every year and it is GREAT! 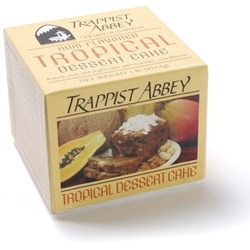 Since I'm the only one in our home who likes fruitcake, every November I order the one pound "Trappist Abbey Our Lady of Guadalupe" fruitcake for my myself. I'm careful to enjoy it for a while, so I cut a piece only about 1/4" thick have it for about a month. 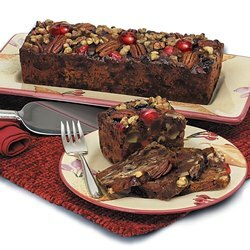 It's the best, so moist and "heavyweight" with all the good fruits and walnuts of a delectable cake. My mother, to whom we sent the cake, said it was rich and delicious--a small piece at a time, with tea or coffee, was a real treat. She also said the bakers didn't stint on the brandy! Thank you all. This is not your ordinary Fruitcake. 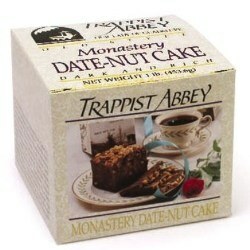 I normally do not like these cakes but, Monastery Fruitcakes are very GOOD. Would make wonderful gifts. I love fruitcake and have eaten a lot of it in my life. However, this was the best fruitcake I have ever had.